Chris Ludlam identified the obscured Instone card from September as another Vimy Commercial shot and further identified the pilot as Franklyn Barnard. Barnard featured again on the Imperial Airways Pilot set but was killed at Filton in a Bristol Badminton racer in 1927 after competing in the Kings Cup air race in the same in the previous year. Both Chris and Simon Penn have been helping me re-activate the project to compile an Imperial Airways check-list/catalogue covering airline-issue and other publisher cards. How this will be made available is not yet decided, as also is how much to attempt to illustrate. I think it unlikely that it will be produced in illustrated paper form but all other combinations of E-Mail, disk and paper are possibilities. Any members with something to add can contact me to get an E-mailed, disk or paper copy of the information to date, but for anything going through the post a stamped (large letter) envelope would be desirable. My own collection is quite strong in Tuck issues and views of Imperial at European airports – France, Germany, Czechoslovakia, Belgium, Greece are known so far. However, for a long time I did not collect artist cards so it is possible that I have missed some of the 1930s publisher series of this type, like Salmon. 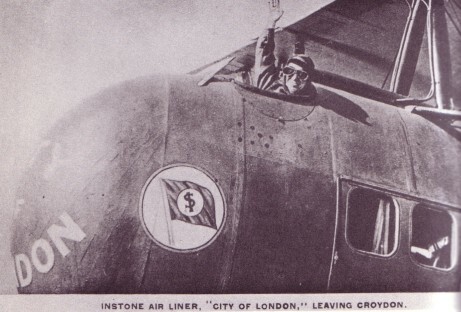 I am also including the pre-Imperial UK airlines Instone, Daimler, Handley Page and have even located one Le Bourget card of the bank sponsored outfit imaginatively called Air Post of Banks.